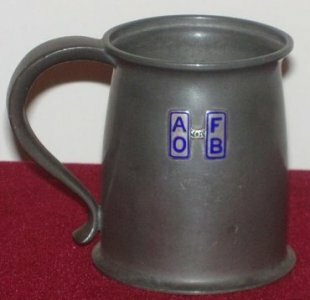 There were several different types of tankard produced ; E.P.N.S. tankards by the Birmingham Medal Co., pewter tankards by Liberty under the Tudric brand and ceramic tankards by the Ashteads Potters. The E.P.N.S. 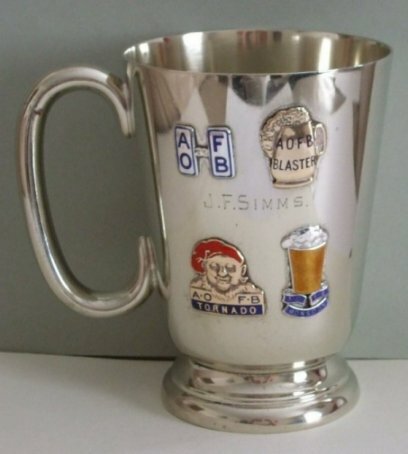 tankards by the Birmingham Medal Co and was priced at 25/- ( £1 5 shillings , £1.25 decimal) for a pint pot and 15/- ( 15 shillings , 75p decimal ) for a half pint pot . 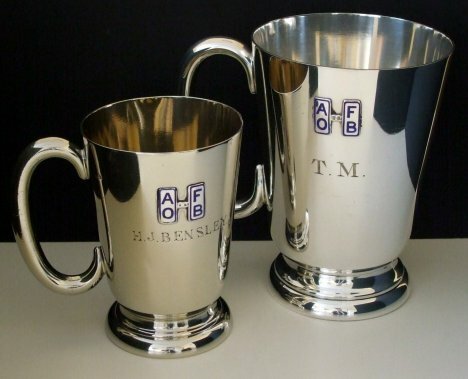 The tankards had the A.O.F.B. 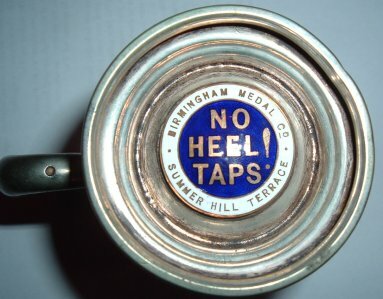 cufflinks "welded on" and could have a badges of rank (if eligible) added for a shilling ( 5p decimal). 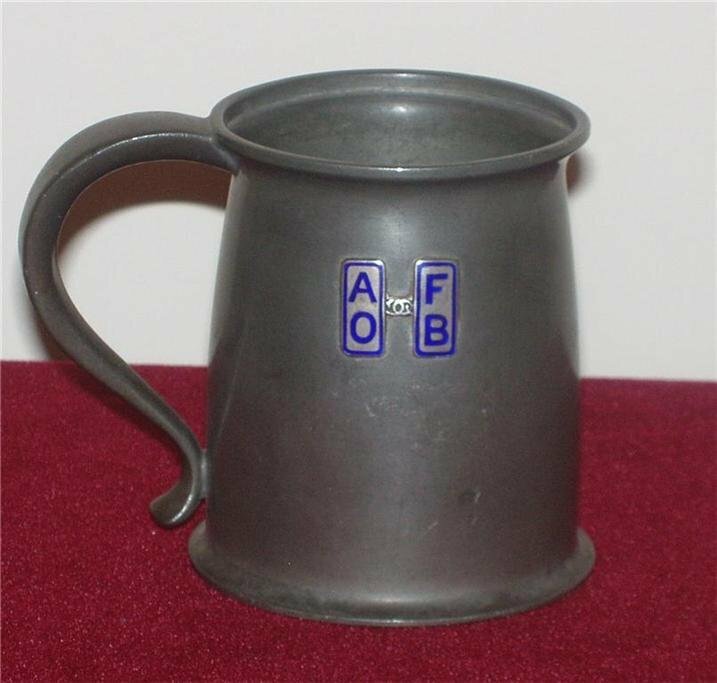 The Birmingham Medal Co. also offered an engraving service for the tankards at 1d per large letter and 9d per dozen for smaller letters. 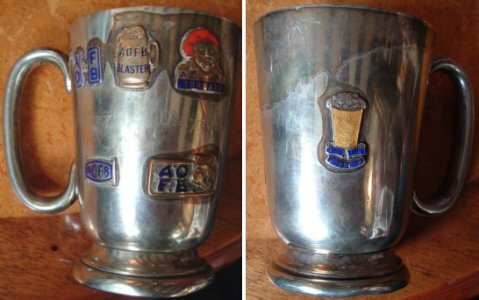 The underside of the tankard showing detail enamelling. blaster badge, tornado badge, monsoon badge and dog collar soldered on. 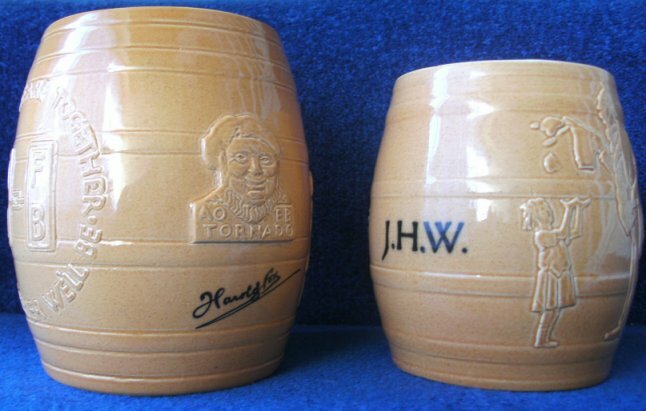 Half pint tankard of HJ Bensley with pint tankard of T.M. 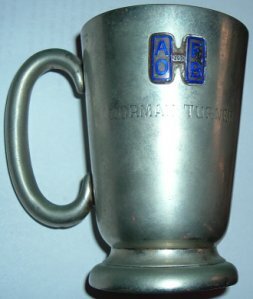 Liberty's produced pewter tankards under their Tudric trademark. 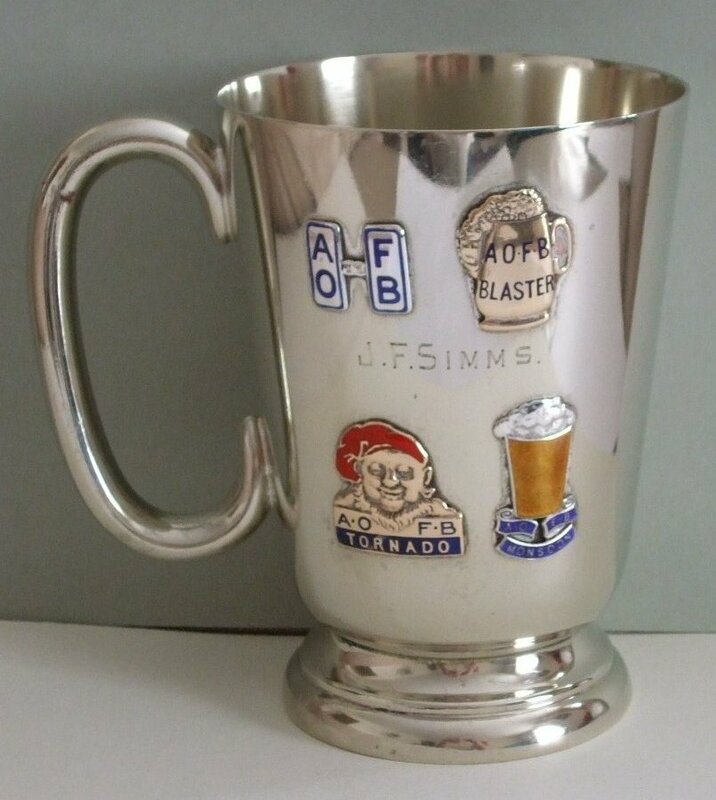 ( a pint for beer, a third for the froth ) and the larger Blaster ( J33 ) and Tornado ( J34 ) sizes at 2 pints ( quart pot ). 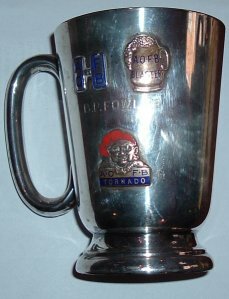 View showing the Tornado J34 version - personalised to Harold Fox with Standard J32 personalised J.H.W. Interestingly both Ashtead Potters and the Birmingham Medal Co. employed large numbers of ex-servicemen (many disabled with injuries from the Great War) in the manufacture of the goods. 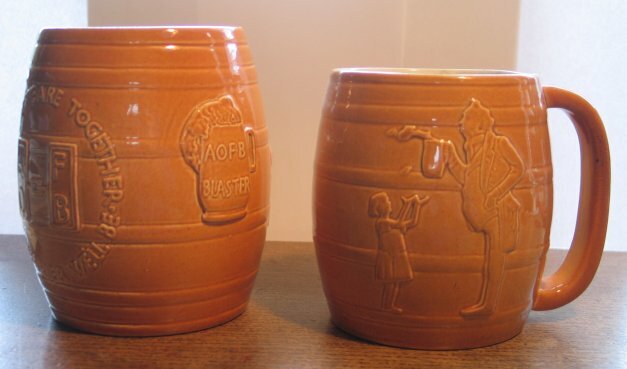 One tale involving the Ashtead Potters concerns two lifelong friends, who grew up together and served together in the Great war, both sustaining injuries. One lost a limb and the other had a severe impediment. They worked for Ashtead Potters, one throwing the clay and the other working the treadmill as they could not produce the pottery by themsleves.